Hull weight (approx.) 500 lbs. Hull type: Sheet plywood hull developed for Fast-G Stitch-N-Glue construction. Power: Single long shaft outboard motor to 40 hp. Short shaft motor can be used if the transom is modified. Can the hull be extended or shortened? No. Some builders have entended the hull but there is not a good way to keep the lines fair and the results have not been consistant. We do not recommend increasing the beam. Trailer: Designed for use with Glen-L Series 1700 boat trailer plans. A compact tabloid cruiser has features usually found only in much larger craft. 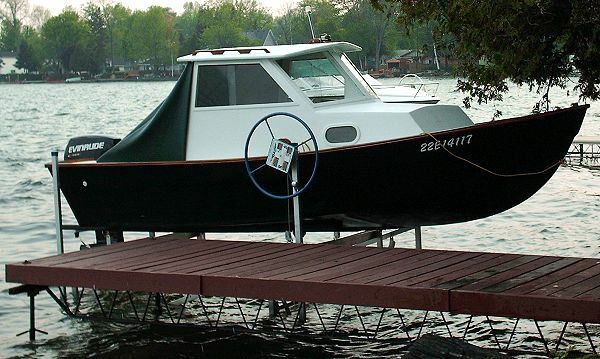 A full walk-around deck... trunk cabin with berths for two... hardtop shelter... and you can build it by the Stitch-N-Glue Fast-G method as described in more detail in our catalog. This is one of the most completely patterned boats of its size. More than 100 square feet of patterns provide a contour for virtually every non-rectangular part. Yes, including all planking, decking, floorboards, transom, breasthook, etc. ... a complete pattern package to eliminate complex dimensional layouts. Only standard 4' x 8' plywood panels are used. Cabin layouts are furnished in the plans but, as an optional extra, Full Size Patterns for the cabin are available. In addition, you receive complete material listings with fastening schedules for both hull and cabin. Complete scaled drawings with step-by-step written text carry you through all phases of building. First-time builders will appreciate the attention to detail provided, but most of all, building with Fast-G makes boatbuilding easy.